William Morris's patterns are enduringly popular for their originality and colour, and have captured the imagination of countless designers and artists. 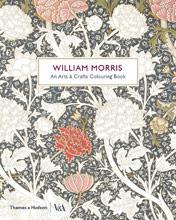 This colouring book explores the intricate work of William Morris, and allows the reader to invent their own colourways to complete Morris's patterns. 45 patterns to colour, interspersed by full-colour reproductions of the original designs. Organized into four sections, Nature, Colour, Pattern and Craft - to highlight different aspects of the designs, and the crafts and skills behind them. Explores Morris's love of nature, his artistry, mastery of colour and innovation in pattern design in concise introductory texts.